3 tbsp of sugar, salt and baking powder. 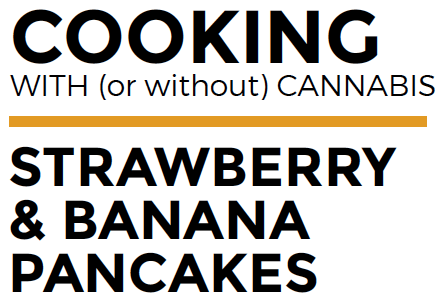 In another bowl, make a wet mix by mixing the melted marijuana butter or regular butter with the milk, mashed bananas, eggs and vanilla, then combine the wet and dry mixes. This makes a batter that is slightly lumpy batter, ensuring fluffiness. Heat a bit of oil in your pancake griddle or frying pan and pour desired amount of batter onto the frying pan. Cook each pancake until the top batter has bubbled and firmed up a bit. Then flip the pancake and cook until the other side is golden brown. Finally, serve your pancakes with butter, prepared strawberries, and syrup if you choose. Enjoy. YIELD: Makes 7 to 9 pancakes.